Aspen Comics is pleased to attend the Heroes Con for the first time as the publisher continues to celebrate its tenth anniversary and their “10 for 10” initiative. This weekend on June 7th – 9th in Charlotte, Aspen creators Frank Mastromauro (Shrugged, Overtaken), Peter Steigerwald (Fathom, The Zoo Hunters), Mark Roslan (Broken Pieces, BubbleGun), Cory Smith (Legend of the Shadow Clan, Broken Pieces) and Khary Randolph (Charismagic) will be appearing throughout the weekend at the Aspen Comics Booth. Aspen will be releasing their latest “10 for 10” offering at the con, BubbleGun #1, featuring a Heroes Con 2013 exclusive cover by Khary Randolph and Emilio Lopez, limited to 250 copies. 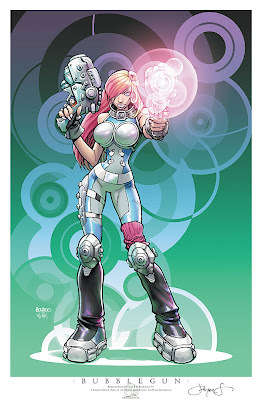 BubbleGun is Aspen’s new sci-fi, action-adventure series from creator Mark Roslan with art by Mike Bowden and David Curiel. The publisher will also be releasing a special Aspen Splash Heroes Con 2013 cover by Aspen founder and superstar artist Michael Turner and Beth Sotelo with Peter Steigerwald, limited to 250 copies. In addition to exclusive comics, Aspen will also be offering an all new lineup of their industry-leading art prints, featuring the latest Aspen Tour Print Heroes Con edition (Limited to 100 editions), as well as the new Aspen Splash 2013 Heroes Con print by Michael Turner and Peter Steigerwald (Limited to 100 editions) as well as new BubbleGun prints by Mike Bowden and Khary Randolph (Limited to 30 each).